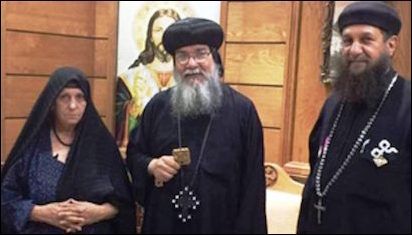 Bishop Makarios (center) stands with a 70-year-old Christian woman who was stripped naked, beat, and paraded in front of 300 jeering Muslims on May 20. After the latest round of attacks on Egypt's Christian minority—which saw at least one Copt stabbed to death and many Christian homes and a church burned—Coptic Bishop Makarios of al-Minya, the region where many of the attacks on Christians take place, was interviewed on television. Although Church authorities in Egypt are regularly diplomatic and sensitive to what they say—more elements in Egypt, including in the government, can seek "retribution" if Christians openly complain and make them look bad—Makarios made many revealing comments. Although only Christians, no Muslims, were killed and hurt, he wondered why the government and media continue to describe these incidents as "clashes"—which suggests two quarrelling parties—when the reality is always that one side attacks the other: "Within minutes [of the start of one of the attacks], 100 Muslims instantly appeared, fully armed, as if ready for war." Well what do you think when the actual attackers themselves are arrested, with complete proofs and evidences against them, but then they are still declared innocent and released?... this happens every single time. When asked what the government did regarding this incident, he said it did what it always does: taking its time, "security comes after all the damage is complete, after the rioters have had their fill of plunder, then it stays in the area for a couple days, and once it leaves, the area again falls under the sway of certain elements." Bishop Makarios ultimately held the government responsible for the repeated attacks on the Coptic Christians of Minya. After he pointed out that "some of the authorities always smile at what is happening," the surprised host asked him to explain, to which the bishop responded: "Of course I don't assume that all authorities have the interest of the nation at heart and are sincere, because if they did, these attacks would not happen time and again, at a rate now of every two or three days."